There’s something about living in Florida that changes one’s attitude towards aging. Yes, I know, Florida – and the St. Petersburg area specifically – is sometimes referred to as “God’s Waiting Room,” but really, I think the only people who use that as a pejorative have never actually been here. Older people in Florida spend their days doing all sorts of active things, and I’m not just talking about shuffleboard. So it’s not really surprising for me to see women who don’t look at their advancing age as reason to hang up their sneakers. But once they got over that, the next point of surprise was from her age. After all, Nyad is 61. Women who are 61 are supposed to be…well, I don’t know what they are supposed to be doing, but swimming from Cuba to Key West is not on that list. Good thing Nyad doesn’t care about any of that, right? Here’s some more women who don’t care what you think is “age appropriate” for them. Shepherd is seriously one of my heroes. Every time I’m feeling a bit washed out or blah, I think of the video clips I’ve seen of her as she executes difficult weight-lifting moves and I get energized all over again. And check out Sensei Keiko Fukuda, who just earned a tenth-degree black belt in Judo. Oh, did I mention that she’s 98 years old? She gave up marriage and left her homeland to dedicate her life to judo, fighting gender discrimination that kept her at lower belt levels decades longer than men less skilled than she. Granted, most of us are not going to ever be marathon swimmers or competitive body builders or judo masters, nor do many of us want to be. And in fact, some people seem to bristle at the idea that these women should be admired or emulated. A commenter in the article about Ernestine Shepherd, for instance, criticized the paper for putting forth yet another standard by which women can be judged and found wanting. I totally understand where that commenter is coming from. 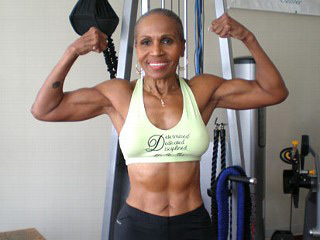 It would be a shame if the main takeaway from the articles about Shepherd is a new expectation that women in their 70s should have a six-pack. But I think there is another way to look at this, and that is to redefine exactly what it means to grow older in this society. I’ll admit, I’ve got a bit of a personal stake in this (and not because I am growing older – that’s true of everyone). My grandmother, who recently passed away, had maybe one of the worst attitudes toward aging I’ve ever seen. I could blame it on the fact that she lived in L.A. or she worked in the movie industry, but the fact is, she had always been afraid to die, and so rather than acknowledge that she had no choice in the matter, she tried to pretend she would live forever. But when she finally realized that it was going to happen whether she wanted it to or not, she shut down completely. She withdrew into herself and spent her time sitting on her easy chair, watching endless episodes of “Bridezilla” and reading inspiration memoirs and books on alternative methods of healing that she never quite figured out how to apply to her own life. She refused suggestions of signing up for Pilates classes or tai-chi, and she wouldn’t even walk outside, despite living in a safe, beautiful part of Southern California. When I told her about my love of running, she scoffed and said, “I hate exercise. The only exercise I need is over there,” and she’d point to her collection of alcohol bottles. She essentially folded up into herself when she was in her mid-70s and she waited to die. She didn’t die until she was 83. That’s a long time to wait to die. And then what made it worse was that she began developing health problems as a result of her sedentary lifestyle, which was directly connected to her depression over her aging. Her blood pressure became a problem and she had major anxiety issues, and her drinking did not help matters one bit. She had crummy balance and she broke her femur at one point, and her cognition declined, and it was just one thing after another until everything just shut down on her. I contrast this with the grandfather of my ex-husband. He also died at the age of 83, after the swift onset of mesothelioma. But up until the day he was diagnosed, he walked several miles each morning. He even held the honor as the oldest person to ever complete one of those Avon Breast Cancer Walks, covering 39 miles in two days with his daughter, a breast cancer survivor, at his side. He was active and vibrant and everyone loved to be around him. Aging and death were facts of life for him, and he didn’t see the point in wasting any of the time he had left. They both died at the same age. (Contrary to what fitness skeptics say, most of us who enjoy physical fitness know we are going to die. We aren’t engaged in some quixotic pursuit of immortality, and it’s not cute or pithy or clever to comment as if we are.) If you wanted me to choose who I’d rather emulate in my waning years, I would choose my ex-husband’s grandfather, over and over and over again. There’s not even a question in my mind about this. Obviously not everyone who is older can be spry and active and walking for miles or even running or playing tennis. Sometimes your body just doesn’t cooperate, no matter how willing the mind may be. But in the case of my grandma, her mind was unwilling, and the rest of her body followed. At the core of her issues was her wholesale acceptance of the belief that older people are dispensable, and that life as an aged person is not worth living. This is a belief that is repeated back to us, over and over and over again, every time you see an actress who gets a facelift or hear conversations about Botox that normalize its cosmetic use or see the way women (and to a certain extent, men) who reach a certain age become invisible or any number of ways in which we diminish the experiences of older people. I’ve been guilty of this myself. But maybe it’s because I’m getting older, and I’m watching my parents and my in-laws and my husband and my friends get older, that I’m now way more critical of the way we look at aging in our society than I ever was when I was in my twenties or my teens. I kind of resent the idea that once I turn 50 or 60 or 70, I might as well just crawl into a coffin and stay there. Our lives and our bodies are gifts, and we only have them for short periods of time before we hand them back to the universe. I’d rather take full advantage of my brief time on this planet, instead of lamenting the fact that it will be over sooner than I’d like. just wanted to say that this is so well written I just want to post it everywhere… thanks!